Baked chicken wings are the perfect game-time appetizer. Thoroughly drying the chicken and adding a light baking powder coating ensures that each bite is crispy. These wings are delicious eaten straight from the pan or served with your favorite dipping sauce like buffalo, teriyaki, or ranch. Crispy baked chicken wings are a tasty option to serve at your next party or gathering. For those health-conscious eaters, no problem, we’re going to bypass the deep fryer and use the oven instead. For this healthier version there’s not a drop of oil involved, well okay, maybe just a tiny bit but only to grease the rack to prevent sticking. That’s it! Just because we’re not deep frying the chicken wings doesn’t mean we can’t recreate a similar texture. Using a simple drying method and just four ingredients will send you on a culinary path to crunchiness. There’s also no flour used which makes this meal gluten-free as well. So, turn up the dial on your oven and let’s get cooking! Dry chicken with paper towels to remove excess moisture. Combine chicken with baking powder, salt, and pepper. Bake on top of an oiled wire rack placed in a sheet pan. Bake until golden brown and crispy, flipping just twice. Serve chicken wings plain or with desired sauce. How long does it take to bake chicken wings? It takes about 50 minutes to oven bake chicken wings at 450°F (232°C). The wings and drumettes contain dark meat, covered by skin and some fat, so it can handle the hot oven temperatures better than lighter meat like chicken breast. In just under an hour, the skin will be super crunchy and the meat will be fully cooked. How do you make chicken wings crispy in the oven? 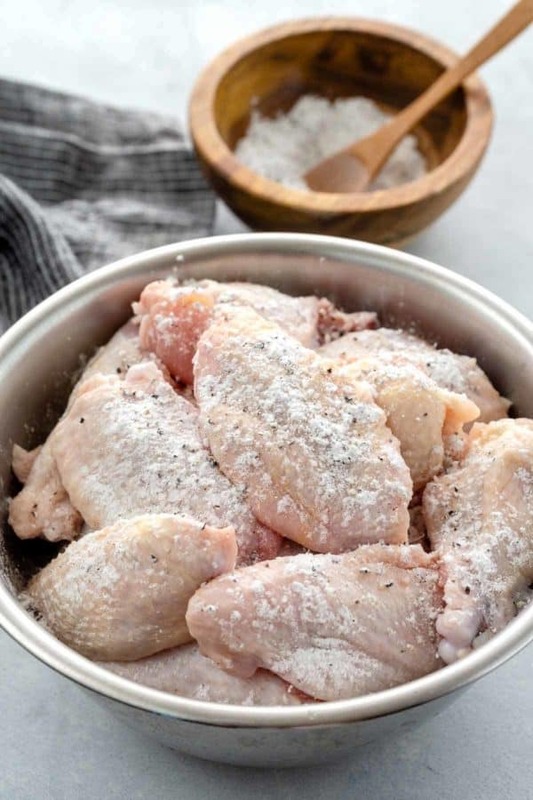 The key to making baked chicken wings crispy is drying as much moisture as possible from the skin, then coating it with baking powder, and cooking at high heat. Moisture on the surface of the chicken will create steam, which makes the skin soggy instead of crisp. By drying the skin thoroughly with paper towels eliminates the time it would require for the oven to dry off the moisture. A small amount of baking soda in the baking powder accelerates browning and creates bubbles that harden on the skin to enhance the crispy sensation. The goal is to create deep-fried results using consistent high oven temperatures. Baking above 400 degrees kick starts browning and cooking immediately. Placement on top of a greased wire rack ensures that the heat surrounds all sides of the chicken and that excess fat can drip to the pan and not make the chicken feel greasy. Make sure to flip the wings two times to ensure even cooking and heat exposure. Looking for a dipping sauce to serve? Each chicken wing is well seasoned with just the right amount of salt and pepper, so the sauce is completely optional. Once you’ve mastered the technique you can venture out and make baked buffalo wings served with a side of ranch. Just make sure to keep this recipe on hand for a game day, the Super Bowl, or other family celebrations. Once you make your first batch I hope you enjoy the results without all the excess frying oil. What is the functional purpose of baking powder? Tossing the wings in a little baking powder does two things. First, it helps the chicken brown quicker, just like it does in cookies. Second, the sodium bicarbonate reacts with any moisture left on the chicken and creates tiny carbon dioxide bubbles on the surface that hardens with heat. The result is crackly chicken skin with extra crunch appeal. Baked chicken wings are the perfect game-time appetizer! Drying the chicken beforehand and adding baking powder ensures that each bite is crispy. Adjust oven rack to the middle position. Preheat to 450°F (232°C). Line a large baking sheet with foil. Set a wire rack inside and coat both sides with vegetable oil. Thoroughly dry chicken wings and drummettes between paper towels. In a large bowl whisk together baking powder, salt, and black pepper. Add chicken to the bowl and mix to evenly coat the surface with the baking powder mixture. Evenly space the chicken on the wire rack. Bake chicken for 20 minutes. Flip and bake for 15 minutes. Flip again and bake until skin is golden brown and crisp, 12 to 15 minutes. Serve baked chicken wings hot with desired sauce like buffalo, barbecue, or ranch. baking soda and baking powder are mentioned in this article. Just wondering if this is a misprint. Love your Chinese receipes. Do you have a book on these recipes? If so, where to buy? Thank you. It has great pics & instructions, but the biggest reason I love this book is for the easy-to-understand, brief explanations of the ‘chemistry’ in cooking…why certain elements are used in a recipe for the best results. 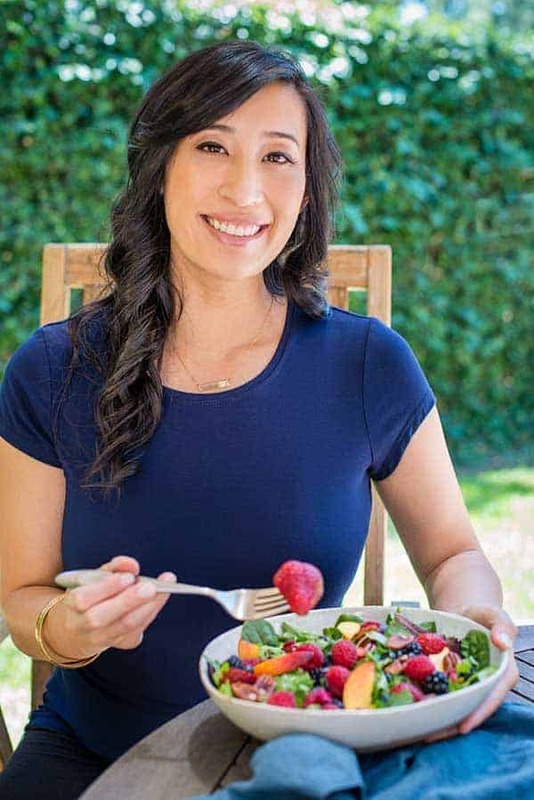 It has a lot of Chinese-influenced recipes (first time I used Hoisin sauce was through one of her chicken recipes) but her focus is very healthy, fresh recipes with easy-to-find ingredients. It’s one of the best cookbooks I have…because I actually use it! Highly recommended. Thank you SO much JJ, you made my day! So happy that you are experimenting in the kitchen and enjoying the results 🙂 Happy cooking! Baking powder!! Never, ever learned this! I’m getting some wings today and try this! Let me know how it goes JJ! EXCELLENT! I bought cleanly trimmed drumettes at the deli. Washed them, laid them out on a (very) clean tea towel on top of the butcher paper and wrapped them up (chicken, towel, butcher paper) to towel-dry while I prepared “Chinese Lettuce Wraps with Ground Turkey” (also one of your recipes…OMG!). It took more baking powder than the 2 t, and I was generous with kosher sale & pepper…all tossed well inside a zipper bag. Elevating them on a rack and turning is essential. Your instructions are to cook ~15 min, turn, cook ~15 min and turn again, and that’s when they really started to get crispy. The aroma of baking chicken was amazing; they came out golden brown, succulent, and we enjoyed the skin, (something we’ve avoided eating for decades). These delicious little drumettes lend themselves to getting dunked in all kind of sauces…a real staple recipe for making chicken that’s tender & juicy on the inside and crispy-crunchy on the outside. Love it! Thanks for sharing! Thank you so much for your insightful feedback JJ! How much baking powder did you end up using? Maybe increase to 1 tablespoon? I bought 20 drumettes, and admittedly, after the first 2 tsp of baking powder quickly disappeared, I just gave the can a generous sprinkle into the bag and stopped there. I think I may have added a HEAPING Tbsp. and even that only slightly coated them. After adding more salt and more pepper & smooshing well to coat, I just let it rest. I realized the baking powder wasn’t there to cover (as in egg wash-and-flour or panko) but that it’s just to dry the skin slightly. But after 30 min of cooking (with 15 more to go) the baking powder really kicked in and gave me great crispy skin. For once, I actually had something come out that looked EXACTLY like the pics. I was elated! 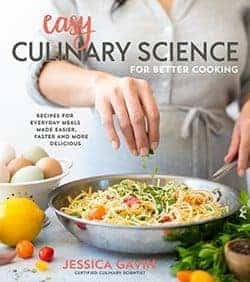 Love the tips science here Jessica. I am always learning from the best teacher, YOU!!! No, just oil both sides of the rack and put foil down on the pan to make it easier to clean up. I’m sure you could, but I don’t have one yet so I’m not sure how to advise. Thanks for the easy, healthier baked chicken wings! It turned out crispy and perfect and used bbq sauce to dip but was wondering is there maybe another spice to add that would add more taste to the chicken?